Ernest Trova, Untitled, n.d. Steel, metal. c The Trova Studios, LLC (n.d.). Laumeier Sculpture Park Collection, gift of the artist. ST. LOUIS, MO.- Laumeier Sculpture Park, in conjunction with St. Louis Lambert International Airport, announces the opening of a new exhibition in the Lambert Gallery, All Shapes and Sizes: Ernest Trovas Legacy at Laumeier Sculpture Park, November 15, 2017May 14, 2018. The exhibition is curated by Dana Turkovic. The Lambert Gallery is located in Terminal 1 baggage claim near the Concourse C exit. All Shapes and Sizes is a careful selection of 35 maquettes and a series of silkscreen prints spanning 15 years, drawn from Laumeiers extensive Ernest Trova collection. The local artists gift of 40 artworks, with an estimated market value of approximately one million dollars, to St. Louis County in 1976 helped to bring Laumeier Sculpture Park to life. With many of Trovas large-scale, sculptural works displayed throughout the Park and the region, his legacy continues to thrive in the local arts community. Ernest Tino Trova was born in St. Louis, Missouri, on February 19, 1927, and died on March 8, 2009. In the late 1960s and early 1970s, Trova was among the most widely acknowledged sculptors working in the United States, resulting in invitations to exhibit in three Whitney Museum Biennials, three Venice Biennales, Documenta 4 in Kassel, Germany (1968) and the Guggenheim Museum, among many other national and international museums. 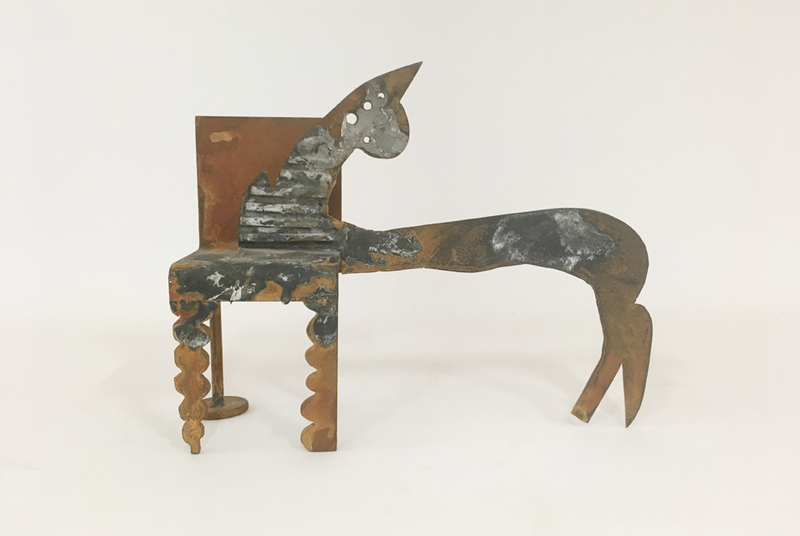 Trova considered his entire artistic output to be a single work in progress; his body of work is beautifully illustrated in these small-scale, sculptural maquettes and works on paper that began the formation of Laumeiers Permanent Collection. The creative process by which Trova approached his stainless-steel and bronze artworks is in concert with his creative philosophy. This particular collection highlights Trovas tendency to initiate a formal concept in two dimensions before expanding into the third and the fourth. The maquettes are selected from his Gox, Abstract Variation, Poets and Falling Man series, as well as a series of small, experimental metal works in abstract compositions.